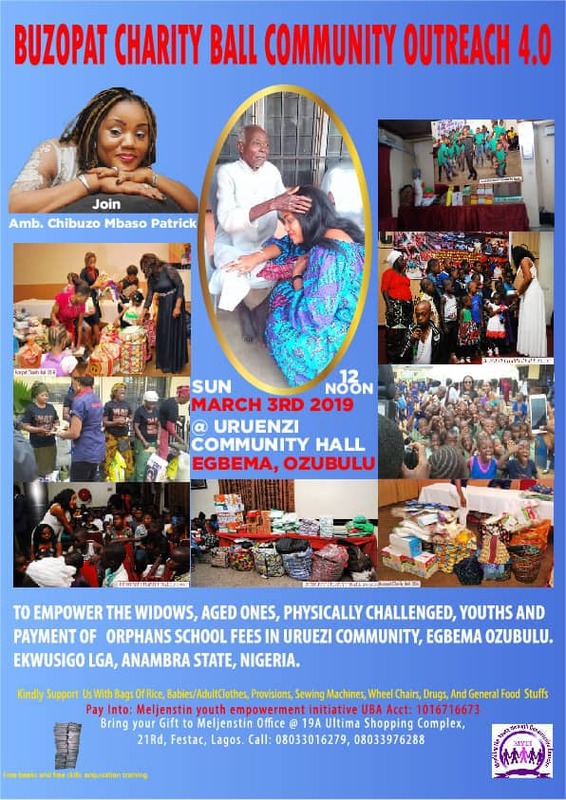 The 2019 edition of the Buzopat Charity Ball community outreach is billed to hold on Sunday March 3, 2019 at Uruezi Egbema Ozubulu in Ekwusigo LGA, Anambra State,Nigeria. 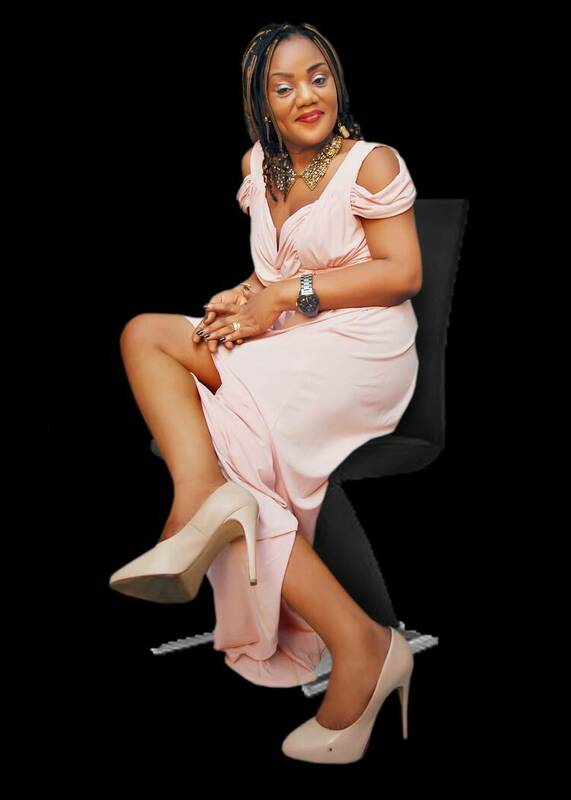 Buzopat Charity Ball Community Outreach a philanthropic exercise by amiable and passionate Ambassador Mrs. Chibuzo Mbaso (aka Buzopat), who is the President and founder M.Y.E.I NGO, is a program designed for the widows, aged, physically challenged and payment of orphans school fees. It is a program that seeks the support of people, government, private organizations and other world donors in other to meet the demands of this venerable sets of people. According to Buzopat, "charity is not an assignment, it's a mission, the passion of giving and touching lives is divine, it's so easy to trace the track of tears on million masked faces just look around you, they are everywhere. Join us and put smiles on their faces by making sure food, clothes, medication and other material things are given out to soothe their needs. March 4th 2018 we paid school fees for children of evergreen ministry with books and other material gifts @Benny Hotel Lagos. March 5th 2017 it was 25 ghetto children from Amuwo Odofin community that were blessed with school fees and a lot of things were given to the community @Rockview hotel Lagos. 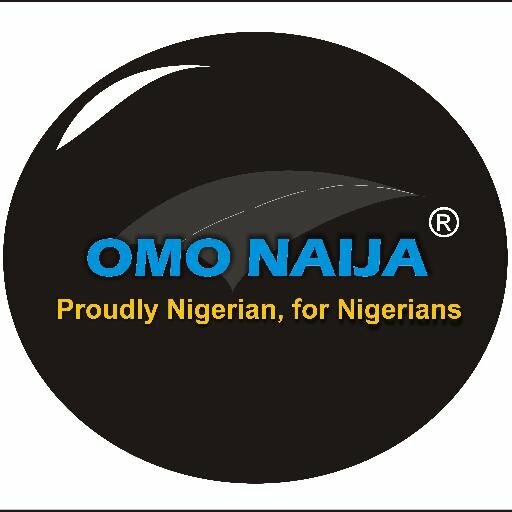 March 6th 2016 we empowered 4 less privileged homes from Festac, Badagry, Okota and ikorodu@Golden Tulip hotel Lagos." "Be the reason some of these people will smile. The society needs you and I, it takes a lot of courage and commitment to assist the down trodden, the oppressed and those who didn't choose to be at the receiving end of life. We can not do this alone, i know that we all do charity but no one can clap with one hand. 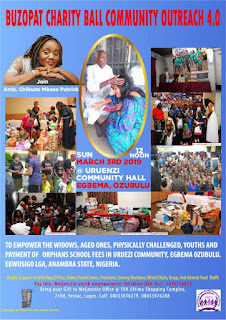 Please kindly make your donations to Meljenstin Youth Empowerment Initiative (UBA acct 1016716673). God bless you.